Men's short sleeve military green T-shirt commemorating the 26th of July Movement, or M-26-7. 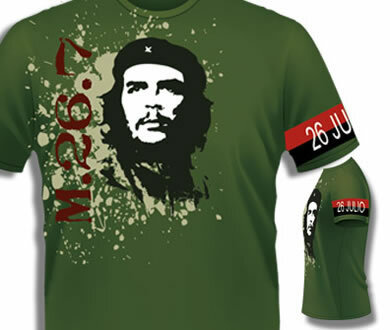 The front of the shirt has the classic Korda heroic Che image and the date M.26.7 on a splash design background. The left sleeve has a replica of the vintage black and red "26 JULIO" armband that members of the Movement wore. The M-26-7 movement was the organization that in 1959 as part of the Cuban Revolution overthrew the Fulgencio Batista government. Made of 100% pre-shrunk cotton. Available in small to 2x-large (2XL).